Many ordinary Australians are taking a growing interest in making informed choices, particularly when it comes to the charities they support financially. We are often contacted by members of the public regarding the animal testing policy of different charities. Most share an eagerness to support human health as well as animal interests. Balancing these concerns can be difficult because many popular health charities fund animal research, often without making it clear to the public. As a result, the public continues to donate money with the best of intentions to medical and health charities not realising that they may actually be funding unnecessary animal experiments. Animal testing causes pain, suffering and death to animals, yielding information of minimal if any relevance to humans. Time and again, relying on animal testing has failed to predict dangerous side effects of substances, and failed to identify helpful medicines. There are so many other, more advanced, accurate, time and cost effective methods to replace animal models in laboratories, it is ludicrous that there are still charities prepared to fund animal research. 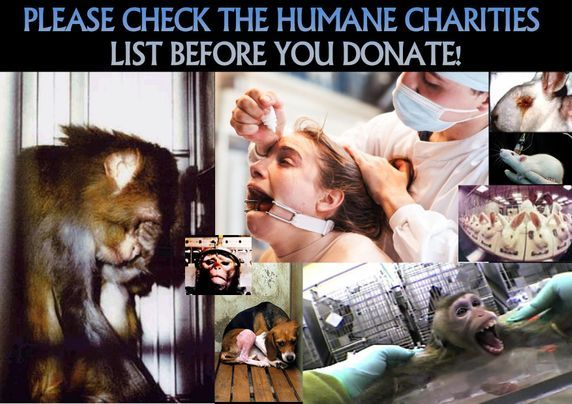 The Humane Charities list is a guide to health-related charities that do not engage in animal research. The charities listed vary greatly in the health-related aspects they offer; some fund bio-medical research, others provide health services to people requiring care, and many provide information and support. The one thing they share is a vision for improved human health. By donating to a Humane Charity on this list, you will be directing vital funding towards organisations that do not fund animal testing. Click below for extensive info and charities which do research but dont test on animals.